Basically folks said to run Linux on the desktop, required a high skill set, and that “the average user” could not maintain a Linux-based operation system. These “maintenance cost,” i.e. hours wondering through discussion forums chasing down answers for complex Linux issues, leads to decreased productivity, thus costing folks more in lost time (when they could be earning money), than other “out of the box” options. In addition, folks argued, because open source applications are feature poor compared to commercial options, there are things you just can’t do with open source tools, again reducing productivity. Getting Ubuntu: ‘sudo apt-get update’? In response to these criticisms I would start by offering installing/upgrading/maintaining Linux on the desktop (I currently use Ubuntu) is neither more complex, nor–to be fair– is it particularly easier than any other system I have used: they are all basically the same. Just like a Mac and Windows you can install the operating system or any application off of a DVD. There are very simple “wizards” to walk you through the download and installation. For some reason, people tend to think instructions like the above command line are required to work with Linux. Yes you can use the above statement in a terminal (apt-get) to install software and system upgrades on Ubuntu, but why would you? 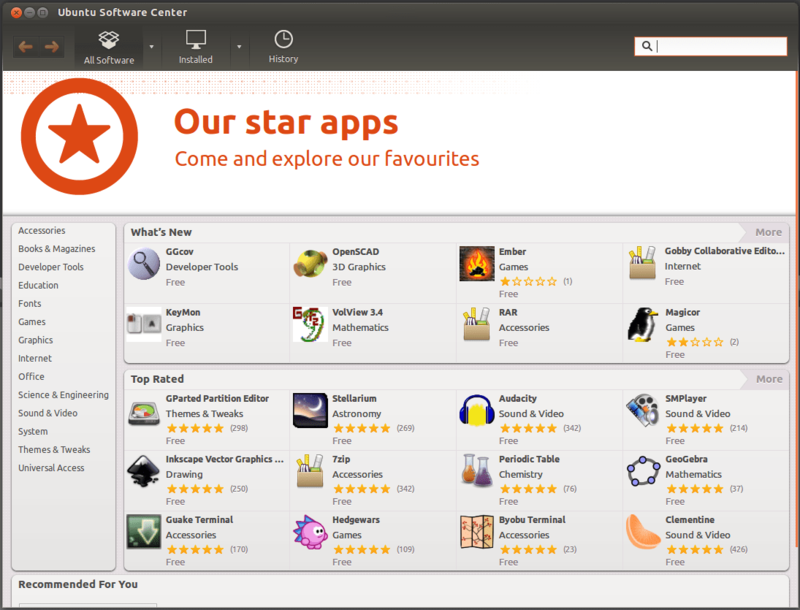 Just use the Ubuntu Software Center, just as Mac users use the Apple App Store and Windows users hit the Windows App Store. Don’t want to do a fresh install of the OS on your machine? You can also simply order your new computer from the manufacturer with Ubuntu already installed, again, just like a Mac or Windows PC. Name brand options, ASUS, Dell, and Lenovo are available, as are computers from dedicated Linux distributors like System 76, Think Penguin, ZaReason and many more (even, apparently, the Commodore 64). So there is no need to bother with downloading Ubuntu and installing it on a machine yourself. Of course one of the advantages of Ubuntu (and really all Linux options) is that it can be installed on older hardware (now you have something to do with that old laptop). I think most Mac and Windows users will admit, upgrading their operating systems–or even applications on their computers–often requires buying new hardware altogether. I am running the latest version of Ubuntu (12.04 LTS) on a five year old Dell Latitude 13. Try running Mountain Lion or Windows 8 (or the latest desktop applications, e.g. Adobe Photshop, Office, etc.) on a four/five year old machine! what they expected of Linux on the desktop. However after about 10 slides, I pulled the veil off to reveal a true Linux desktop and the features and functionality within. At the time I was using SUSE Linux Enterprise Desktop (SLED) supported by Novell and shared some funny videos with the audience, again playing a bit on common mis-perceptions. Today, this is perhaps a more relevant video highlighting the usability of Linux desktop. Like then, today I would put forth there is absolutely nothing a typical computer user cannot do on a Linux desktop that they do on a Mac or Windows PC. The administration and configuration of the computer through the operating system provides all the same features and functionality to manage users’ access and permissions; create, store, search and retrieve files and documents; install and remove applications, access local networks and the Internet, install and configure peripherals (e.g. printers scanners, etc. )–all through an intuitive and robust graphical user interface. Again, it’s not easier or harder, it’s just a different set of mouse-clicks. As far as the applications available, there are as many applications as you would ever need for office productivity, image processing, illustration, desktop publishing, 3D modeling, email, music, video editing… Again, these are not “shareware” or “freeware” from the 80’s, but rather full feature tools as feature-rich as commercial options and–if not already pre-bundled with the Linux desktop operating system–are readily available for free download directly through the operating system’s software management tool (like Ubuntu’s Software Center mentioned above). My first computer (probably like most folks) was the Commodore 64. I’ve owned and worked on various Apple computers (and the associated OS) for both personal and professional work, starting with the Apple IIe (I still have one), the first Macintosh (still have the one I used in college), the Mac Quadra 700, a Powerbook 5300 (yup my first laptop which I also still have), the PowerMac G4 & G5, the–of course–the iMac (I’ve still got two flavors at home: Bondi Blue AND Snow) and a Aluminum PB G4 (this was my last personal machine before moving to Linux). Even today my family has an iMac (Intel-based) desktop, a MacBook Pro, several iPods, an iTouch as well as an iPhone and iPad. Ubiquitous PC’s (Dell, HP, IBM, Toshiba) running Windows 95, 98, NT, 2000, 2003, Vista, 7. My son now has Windows 8. For 10 years while at UCLA, in addition the some of the Macs listed above, I worked on Sun Microsystems’ Sparc and UltraSparc (running Solaris) machines, however my primary workstation was an SGI Indigo2 (running Irix, then Microsoft NT and finally Redhat Linux–my introduction!). Multiple Linux flavors, Red Hat and Fedora, openSUSE 10 and Novell SUSE 11 and now Ubuntu 10 & 12 as well as Androids with Ice Cream Sandwich and Jelly Bean. believe success with Linux on the desktop is not determined by the users previous experience. I offer the above not as hyperbole or zealotry for Linux on the desktop but rather, hopefully, as a qualified voice. As such, I strongly believe the care and maintenance of any operating system and the software installed on it, is pretty much the same. The more specialized software and services you run, and the more sophisticated your use, the more complex and challenging it will be to manage your computer. The more challenging it is to run your computer, the less productive you will be with your primary interests (like anything, until you get the hang of it). Using a computer (Linux, Mac or Windows) as a typical user to go on the web, read/write emails, manage documents (letters, spreadsheets, presentations) will always be far easier–no matter which platform you use–than working with high-end applications (graphics, publishing, programming, networking, etc.) and peripherals (scanners, large format printers, remote desktops, file/application servers, etc.). To be honest–despite the open source cliché, that open source communities are more helpful–with the rise of the social web and Web2.0 tools, I find most of the communities supporting Macs, Windows, Linux all readily available, responsive and helpful. For example, just last night, while working with my son on an issue related to Eclipse, Minecraft and Windows firewalls (his summer camp is running Windows 8), my son and I found a solution quickly via a user group online. Mac users too have formed around common interests to share best practices, support one another and submit issues. I think all platforms are benefiting from open communities of practice, and if you’re truly honest, don’t these Windows and Mac support groups, who self-organize around affinity products and projects, sound a lot like the open source model, i.e. many eyeballs make all bugs shallow? And while many are now comfortable reaching out to peers on open discussion forums, others may wish to contact “support” directly for dedicated and targeted help from a professional support analyst. The “Genius Bar” at Mac Stores and Windows support through Geek Squad are convenient and easy, but so is Novell’s for SUSE as well as Canonical for Ubuntu. I have used all four of these services and find them each readily accessible and helpful (notice I did not include Microsoft direct support–hmm, not so much). Beyond support, I suppose the the real challenge for anyone is simply making the leap to another operating system. If you’ve been given a Windows machine at work and have been happily plugging away for years, then it makes sense you would get a Windows PC for your home–it’s what you know. Why would you switch to Linux, or even a Mac for that matter. You know what you know and who wants to invest in learning a new platform? I expect one might only change if: 1. there was a tremendous advantage (features, cost savings, ease of use) with the new operating system, 2. you hatted the system you already had and would take anything else, or 3. you had no opinion either way (perhaps starting off anew with desktop computers or willing to explore options). So what are those compelling reasons to try Linux? I suspect if you’re familiar, and comfortable, with Windows it might be a real challenge to switch to a Mac. 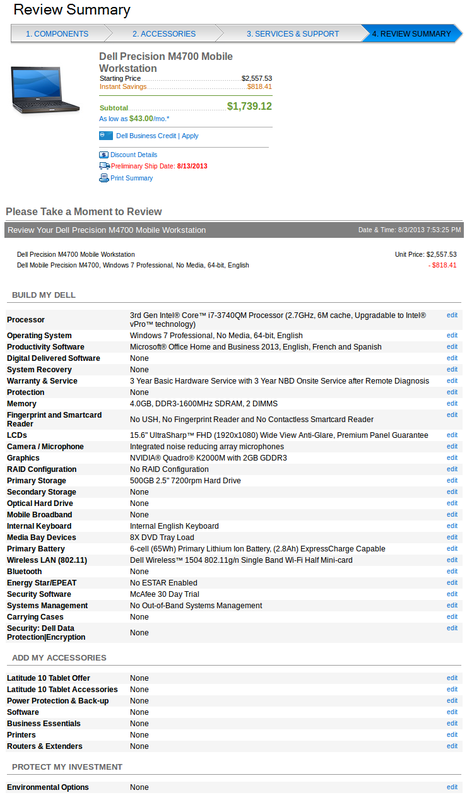 After all, a Mac can run $500 – $1,000 more than a comparable Dell running Windows. So why pay more to do the same thing, but have to re-learn it all on another platform? Mac enthusiasts may offer a slightly different argument, although still based on affinity over rationality. Why switch to Windows–and suffer–if you’re only going to save $500 – $1,000 bucks and you really do enjoy the Mac experience? I posted a list of the benefits of open source software, e.g. operating systems (and even more broadly for other open initiatives like Open Educational Resources) a while back. There I offer many advantages that the open source development and community model offer to those who choose to adopt and participate. While many of these benefits may not be directly related to your experience as a general computer user, these attributes are what enable open source to not only exist but excel, driving innovation (notice number 2 here). Of course, and as I noted, the most obvious consideration users look at first when assessing software is cost. So as a service to those folks, I have listed the software currently installed on my Dell Latitude 13 laptop as well as my Acer AspireOne, both running Ubuntu compared to a Microsoft Windows PC competitor. Obviously this is not exhaustive, but I think it represents the tools that I use 80-90% of the time. The best news is, you can test this out yourself and the barriers are very low. As I mentioned above, you’ve probably got an old laptop or desktop computer sitting around. I also suspect you could find a few hours to download/install one of the Linux options. Then, simply click around and see for yourself. You are currently reading Linux on the Desktop at TwoThree98.